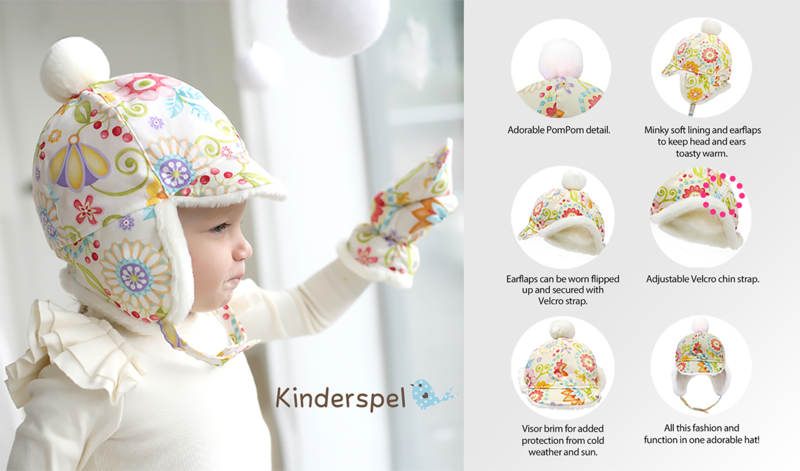 Winter Hats will keep your toddler’s head and ears warm during the colder months. Outer, patterned part of the hat is 100% high quality cotton that will retain its bright, bold colors and is easy to clean. Hat is lined with luxurious, super-soft Minky fabric, which is softer and thicker than fleece to provide optimal comfort. Topped off with a matching white pompom for extra cuteness! Wear the flaps up or down to change style and level of coverage. Great for all kinds of winter outdoor activities! We bought this hat specifically because of the ear flaps. I hate cold ears! The inside is a soft flannel like material, and is very warm. The pom-pom on top is a fun touch, and I love the pattern! We ordered the size Large. My daughter just turned 3 and it's a nice fit. It stays on her head, but she still has room to grow. Also, the velcro tie on the bottom is nice because it keeps it on her person if it's really windy. I love it and so does my daughter. Would definitely recommend!